Our Kyle is 12 already, and it seems like only a couple of years ago he was born. We were filled simultaneously with excitement and trepidation. Upon receipt of his diagnosis of Down syndrome, my husband was the rock and took the news in stride while I was terrified. I was so afraid of the unknowns. Fortunately, God placed some phenomenal people in my life early on to hold my hand along the way. These people included our family pediatrician, family, friends, and our lifelong friends at the RISE school. In recent years, Kyle has continued to provide a steady stream of phenomenal people in my life. His transition into the public school system has introduced me to a steady stream of matchless teachers, aides, and therapists. And, in the community Kyle has introduced me to phenomenal coaches and clergymen. At 12, Kyle is happy, thriving and enjoying his loves such as playing outdoors, swimming, and hanging with his friends and family. 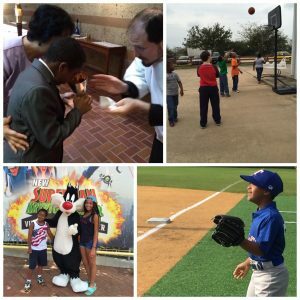 Like our typically developing daughter, he is experiencing all of the joys in life such as travel, competitive sports, and receiving the Sacraments, most recently his First Communion. To all the young parents out there, all that I can offer and speak of is what I was assured of and ultimately experienced. Like with all other children, cherish each and every moment with your special child. Those fears dissipate, the joys become infinite and boundless, and before you know it, your child is 12!